The Oak Trail Course is jokingly called the Family Course. Does the cost include a golf cart: No, it includes a pull-cart. Walking only. Misc: The Pro Shop carries golf apparel, equipment, and accessories. Where is it: The Oak Trail Course is located in the Magic Kingdom Resorts Area. Parking: There is free parking near the Pro Shop (non-resort guests are charged about $5 to enter and park in the area). What resorts are near by: Shades of Green, Grand Floridian, Polynesian, Contemporary, and Wilderness Lodge. The family-play, par 36 layout measures 2,913 yards, 2,552 yards from the front tees, and features fairways lined with majestic oak trees. "Oak Trail is an excellent 9-hole course," says Disney head pro Kevin Weickel. 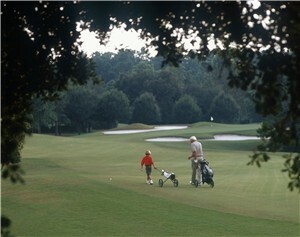 "It has small, challenging greens and two of the best par fives on property. "On this course, golfers have a chance to use every club in their bag," Weickel continues. "It's a great place for the developing golfer to learn the game, and for the experienced player to hone skills." At 517 yards, No. 5 is the longest hole on the course. It features a double dog-leg, bending left and then right to a green guarded by bunkers. In addition, golfers must guard against a ribbon of water running along the right side of the fairway the last 150 yards into the green. Mature oaks and tall Florida pines create a chute effect for the fairway of No. 6, a straight-away, 378-yard par 4. The approach to a small undulating green guarded by water and framed with tall trees reminds golfers of sylvan courses a thousand miles north. A narrow water hazard which crosses the fairway 120 yards in front of the white tees on No. 7 challenges golfers' nerves. The 489-yard par 5 dog-legs right with water providing a hazard to the right of the fairway near the green. Large bunkers guard the green left and back. Considered by many to have some of the best putting surfaces on property, Oak Trail's greens are anything but easy to putt. "It's a hidden jewel of Walt Disney World golf," Weickel says. "There's more undulation than on our TOUR courses [Magnolia and Palm used for an annual PGA TOUR fall event]." Most greens and tees are elevated, mirroring the character of the Joe Lee-designed Walt Disney World championship courses -- Magnolia, Palm and Lake Buena Vista.